Kick it into high gear with the Mickey and the roadster Racers custom car kit! now every fan of Disney Junior's Mickey and the roadster Racers can play out a piece of the action by building and customizing Mickey Mouse's rock in' racer! this awesome set lets kids transform mickey's rover into his hot rod and comes with over 20 pieces to help mix, match and fix the deluxe play race car. Customizable pieces include two car hoods, two seats, a spoiler, dome, engine, windshield, and tires. 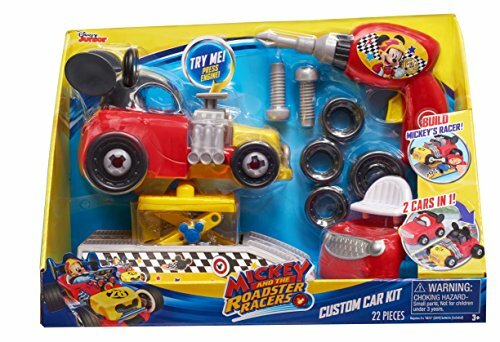 Mickey's roadster Racers custom car kit includes over 20 pieces to customize your racer! Play car features fun Mickey phrases and realistic sound effects! Play pieces include: car pieces, lift, impact wrench with Screw bit, engine, rover & hot rod seats, dome, windshield, spoiler, 4 rover tires, 2 hot rod tires, and 4 play screws. The lift really works for tune Ups and even more fix-it play! The kid-powered impact wrench really spins! If you have any questions about this product by MICKEY ROADSTERS, contact us by completing and submitting the form below. If you are looking for a specif part number, please include it with your message.